New Prague library = Kafka’s Metamorphosis? One morning, as Prague was waking up from anxious communist nightmares, the people discovered that their library had been changed into a monstrous verminous bug. The Guardian covers the controversy here. The site is an historic part of Prague, just across the Vltava river from Kafka’s old Jewish quarter. The library would offer great views of the city’s famous bridges. Former Czech President and man of letters Vaclav Havel likes the project: ‘I had the feeling that the eye of the library, blinking over the green of the park… could stand like an embodiment of the past centuries.’ … A bigger threat, Havel wisely says, and this applies to most cities, is that ‘averageness and banality [will] triumph again’. The director of Prague’s National Gallery says the library’s form is too ‘strong’ for the delicate grain and texture of the historic quarter.The President of the Czech Republic dislikes it too. So does the Mayor of Prague dislikes this design. But , get this, in October, the mayor debated the architect on Czech television! I love that. Could Daley or Bloomberg debate an architect on live TV? I think so, and I’d like to see it. Anyway, the architect seems to have won the debate. More than 12,000 people signed a petition to insist the library gets built. The National Library’s enemies have called Kaplicky’s design an ‘octopus’. But I’m glad that great new libraries, like art museums, are used by city leaders to mark and market who they are. Think Seattle, Paris, Salt Lake City, Alexandria! Chicago? In the Czech language, we are told, the word ‘Praha’ is feminine… like love, death and night. Update: Prague, Feb 6, 2008 (CTK) – The International Union of Architects (UIA) has again upheld the results of the international architecture competition for the new National Library (NK) building in Prague and thus definitively refuted all doubts about the contest’s regular course…. 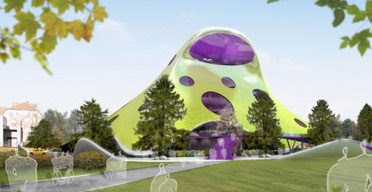 The winning design, submitted by the studio of Czech-born British architect Jan Kaplicky, has divided the public as well as artists and politicians into the camps of its supporters and opponents. You are currently browsing the archives for the Kaplicky category.